m and witty at Theater for the New City’s beautiful send off to long time theatre critic Jerry Tallmer. Crystal Field, head honcho of the theatre opened up the evening of ruminations about this talented critic , one who was first to encourage the works of the radically different playwrights like Jean Genet, Brecht, Edwar Albee, Tom Stoppard and Sam Shepherd. God, he even created the Obies. Ed Fancher, the remaining living founder of The Village Voice, gave a detailed history of the early days of the Voice and Tallmer’s contributions not only as writer, but delivery man. When Norman Mailer’s aggressive style with the news vendors proved too rough, Tallmer was the one to step in. He was the only one who really knew how to run a paper from his Dartmouth days and so it was left to him to drop off papers and oversee production with a printer in New Jersey every week. It was a magical New York, fresh out of the locked up fifties and bursting with energy. When Billie Holiday was asked to perform for a benefit for The Voice, it was Tallmer who drove to Philadelphia, found a pretty juiced up Holiday, struggled in traffic and brought her to the show on time. Baby Jane Dexter and pianist Steve Ross, two performers who were given the green light from Mr. Tallmer’s pen, performed a couple of songs, Dexter’s voice deep, rich and jazzy, and Ross, giving an old lower East Sider Irving Berlin , a chance to Put on the Ritz. 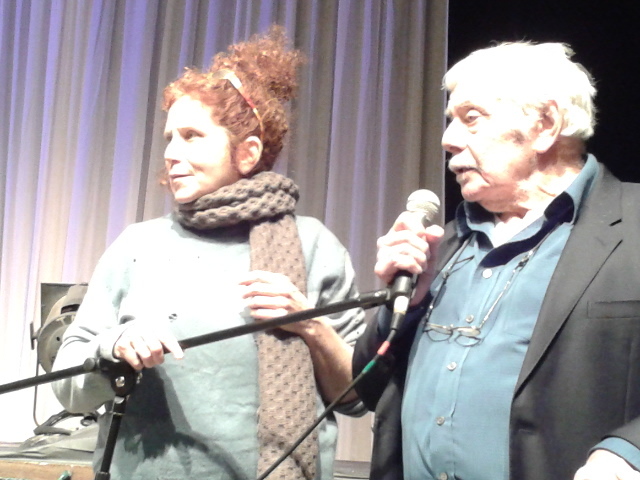 Another Jerry, Stiller, regaled the crowd with adorable anecdotes about his early days in Shakespeare, screamingly funny while his daughter Amy, read one of Tallmer’s reviews of her father’s performance, memorable primarily for the great acting of his scene partner, a dog. Two things I learned was that Tallmer was let go from the Post when he supported one of the newspaper unions’ strike. He had sailed through the Murdoch takeover, but showed true courage to given the publishing climate. Also, he was an air witness to one of the bombings of Nagasaki; surely something like that must have affected him in the way Kurt Vonngegut’s creative life was intensified by the destruction of Dresden. Someone read a piece Tallmer wrote about Norman Mailer’s Town Hall debate with Jill Johnston and Germaine Greer. I’ve seen the film and everyone should read the article for themselves, as it speaks so much to the time of early feminism and sixties happenings. Many references were made to the love of his life Frances Martin. She modestly only took a bow when heckled to do so and one can understand why this aesthetic man was so devoted to the lovely, Flamenco dancer. The last speaker Lincoln Anderson of the Villager where Tallmer spent some of his third act was bubbling with the enthusiasm of a writer who most likely should have lived in the sixties, but does his best now to keep the political beat happening at this downtown rag. Like everyone, he was gracious in his admiration. We’ve lost three journalists just this month: Bob Simon, Dave Carr and now Jerry Tallmer. Let’s hope there are equally inspired writers, women and men, ready to step into their shoes and media worthy of their talents. The evening’s speakers: Crystal Field, Steve Ross & Baby Jane Dexter, Ed Fancher, abbey Tallmer, Austin Pendleton, Diana Maychick, Jonathan Slaff, Mario Fratti, John Sutter, Bill Ervolino and Lincoln Anderson.